Brown garden snail (Cornu aspersum) from Catalonia. Picture: Ferrean Turmo Gort (Source). 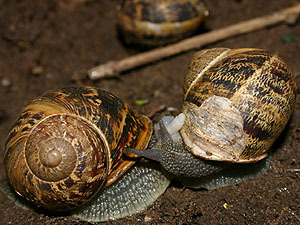 The brown garden snail (Cornu aspersum) is one of the most widely spread land snail species in the world. Originated from the Mediterranean it is today found is as far away areas like Northern America (South Carolina, Louisiana and California), Southern America (south of Brazil), Australia and New Zealand, as well as in South Africa. Compared to the Roman Snail (Helix pomatia) the shell of Cornu aspersum is usually a bit smaller. It is between 25 and 40 millimetres wide and between 25 and 35 millimetres high. Usually the shell of Cornu aspersum, compared to Helix pomatia, is a bit more spherical, the last of the 4 ½ to 5 shell whorls is clearly wider than the others. The scientific species name of the brown garden snail, aspersum, means "spotted", referring to the shell's colour pattern. On a light yellowish to brownish base colour there are several darker longitudinal bands, that may be spotted in a lighter colour. Laterally there are yellow zig-zagging stripes. The shell surface is characteristically wrinkled. Besides this dark type of the brown garden snail, especially in heliciculture farms there are less colourful types, that may even be of one only colour. Common to all is the wrinkled shell surface and the conspicuous folded apertural lip. Unicoloured shell type of Cornu aspersum. 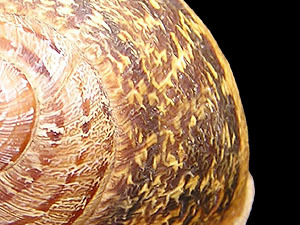 In contrary to the dark colour of the shell, in adult specimens the conspicuously light coloured apertural lip makes the finishing rim of the last whorl. In the columellar area usually it completely covers the umbilicus (shell navel) (see picture on the right). The brown garden snail lives in various habitats. Besides synanthropic habitats in gardens and parks made by man, it also lives in coastal dunes, grove and bush land, between rocks. In contrary to Helix pomatia, Cornu aspersum is not that dependant on a limestone underground. But it neither often appears in the fens or in deep forest, nor on open meadows, where there is little visual shelter against predators. Instead, it prefers habitats with hiding places in rock and wall crevices or below thick vegetation cover. In the mountains Cornu aspersum climbs up to below 1000 metres. pomatia (yellow) and Helix lutescens (green) in Europe. Source: Kerney et al. (1983) (within limits of discussion area). As mentioned in the beginning, the brown garden snail today is distributed almost world wide. Fossil findings from the upper Pliocene in Northern Africa, as well as from the Quaternary in Southern France, adjacent Spain and of Corsica point towards an original distribution pattern in the Western Mediterranean. From there the species has been distributed synanthropically in garden areas, but also because of its use by man as food in the climatically temperate areas of the Mediterranean and adjacent coastal areas of the Atlantic. It is assumed today, that Cornu aspersum reached the British Isles long before the Romans did, for example already with the Celts. In many other parts of the Empire, though, the species was introduced due to the spreading of Roman civilisation. The latest additions to the distribution pattern of Cornu aspersum happened during modern times, the snail introduced practically world wide with fruit and vegetable transports. In Central Europe Cornu aspersum has not been able to spread in a continuous area, because the more continental climate bears more severe winters. Which is why Cornu aspersum, not being able to cope with too low temperatures, is only to be found in the relatively temperate areas of the Upper and Lower Rhine areas, in Austria even only introduced in a little spot near Vienna Simmering. matia, as the photographer Hans Josef Köhler has observed. Being an inhabitant of areas with oceanic temperate climate, the brown garden snail is not able to to endure the severe Central European winters as efficiently as Helix pomatia does. In contrary, Cornu aspersum does not produce a hibernation lid, but instead closes the aperture with a mucus membrane and hides in a sheltered place, where often numerous snail gather for the winter. There are also distinct differences between Helix pomatia and Cornu aspersum concerning the genital apparatus of both species. With Helix lucorum, Cornu aspersum shares a conspicuous diverticulum, an appendage to the Bursa copulatrix channel (see: "The genital apparatus of Helix pomatia"). 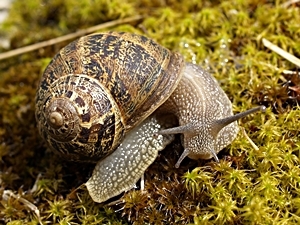 During the mating procedure, which, in Cornu aspersum other than in Helix pomatia, takes place in the horizontal position common among land snails, a love dart may be applied that injects a hormone secretion into the partner's body. This is specially being researched in Cornu aspersum. Though Cornu aspersum is a relative of Helix pomatia, it does not belong to the genus Helix. However though, it is often misleadingly called Helix aspersa. See also: "The Cornu problem". Today the brown garden snail makes the largest part of French snails raised under the name "Escargot petit gris" (little grey snail, in contrary to "Escargot de Bourgogne" meaning Helix pomatia and "Escargot Turc" meaning Helix lucorum). Specially cultured giant forms ("Helix aspersa maxima"), though with a shell brittle like an egg shell, can reach double the size of a common brown garden snail. Arkive (Images of Life on Earth): Garden Snail (Helix aspersa). Videos auf Arkive.org. Dekle, G.W., Fasulo, T.R. 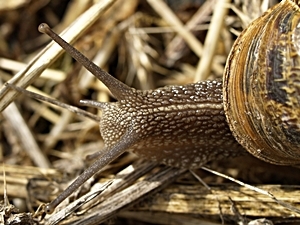 : "Brown Garden Snail (Helix aspersa Müller)". Department of Entomology and Nematology, Florida University. BBC Facts Page: "Garden Snail (Helix aspersa)".